This is the artwork for the forthcoming Decca CD from L'Abbaye de Notre-Dame de l'Annonciation du Barroux with added ornaments to reflect the topical playlist for my Chance Music programme on Sunday, August 1. * Listen to a podcast of this Chance Music programme here. * Titi Robin is appearing with Faiz Ali Faiz at the Barbican, London on Sept 18 in a performance of Jaadu Magic, which I enthused about last year. It should be an unmissable evening, but sadly we will be in Languedoc on the path of the Albigensian Crusade. * More Gregorian with added ornaments here. 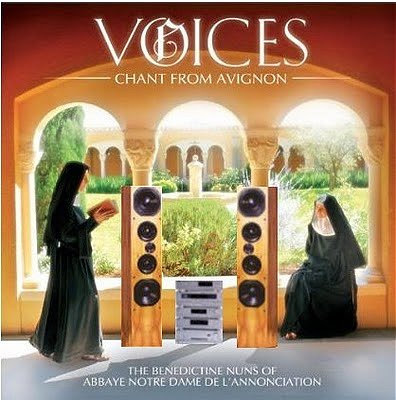 (and the NUns already have 3 other CDs Cassettes and a DVD out, but on much smaller label/scale. um,. ok,well, a promotional video for Universal Music .... you may be interested in Chapter 7 of the Rule of Saint Benedict. The twelfth step of humility is concerned with the external impression conveyed by those dedicated to monastic life. The humility of their hearts should be apparent by their bodily movements to all who see them. Whether they are at the work of God, at prayer in the oratory, walking about the monastery, in the garden, on a journey or in the fields, wherever they may be, whether sitting, walking or standing they should be free of any hint of arrogance or pride in their manner or the way they look about them. Regular readers will know I have visited L'Abbaye de Notre-Dame de L'Annonciation and L'Abbaye Sainte-Madeleine at Le Barroux, which is a long way from Avignon incidentally, many times over the years. I have also written positively about the communities there and the recordings they have made of chant. But I have a healthy degree of scepticism as to whether signing for a major record company that markets the nuns as stablemates of Lady Gaga and U2 is in line with Saint Benedict's Rule 12. Talking of infallibility, I notice that Uber Ultramontanist's blog, which appears to use a lot of copyright recordings of chant, does not allow comments. Thanks for visiting Uber Ultramontanist and I hope you enjoy the programme. This quote from the Telegraph website is also relevant to the link I give above and the past links between the Benedictines at Le Barroux and Monsignor Marcel Lefebvre. While this needs to be read in conjunction with Uber Ultramontanist's web name. Please can we get back to the music now? I mentioned that Titi Robin's daughter sings on Kali Sultana. But I did not mention that Jonathan Harvey's son appears on Mortuos plango, vivos voce for eight channel tape. It is his voice modified by IRCAM electronics that is heard together with the sound of the great bell of Winchester Cathedral. Jonathan Harvey's son was a chorister at Winchester in the 1970s.